DETAILS: Welcome to "Blue Haven Cottage", a charming four bedroom cottage in the Camp District of the WaterColor community. 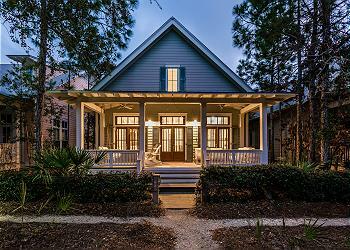 You'll be welcomed by it's sprawling front porch, a perfect place to retreat from the afternoon sun or enjoy your morning coffee. 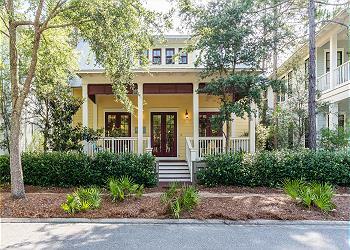 Recently updated with refinished natural hardwood floors and beautiful granite countertops, the interior of the home will exceed your expectations with it's open, airy layout, well-appointed kitchen, spacious dining area and luxurious bedrooms. The wonderful open floor plan allows plenty of space for guests and entertaining. 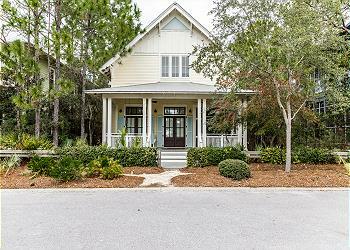 The master bedroom is conveniently located on the main floor and opens up to a private screened porch. When you're not enjoying this cozy retreat, hop on the provided bikes and take advantage of the incredible amenities WaterColor has to offer including multiple community pools, the Boathouse, parks, trails, tennis courts and fitness center. Explore all the local shopping and dining as well! Book your stay with us at 360 Blue today! We had a wonder time at Blue Haven! We had 9 people at one time and it was great! The house was very well stocked with everything we needed.....and then some! It is super close (a short bike ride) to Publix, which was a bonus! The beach shuttle is great and made going to the beach super easy! Having them a phone call away is awesome! The addition of having the 8 bikes also came in so handy! We would definitely stay here again!! Thank so much!